Honored by everyone from Oprah Winfrey to Johns Hopkins University during his 17 years in the Los Angeles public-school system, Esquith explains how he molds disadvantaged kids into high-performing fifth- and sixth-graders. His counsel is hard-won—the book positively floats on anecdotal evidence—and the author doesn’t boil it down to a few tidy aphorisms. Esquith demonstrates in detail that little of lasting value is attained in an instant; achievement comes instead from “discipline, hard work, perseverance, and generosity of spirit.” Teach by example, like an Atticus Finch, he urges; make sure you get kids out in the world, let them see what they are working for. Fight the gospel of mediocrity: “I got rid of state-sponsored books,” he writes. “They killed the joy of reading.” He could only fire up a desire to pursue learning in his students if he was passionate about what he is teaching, so out went comprehensive guides and routine texts; in came much effort and attentiveness, translated into many extra, unpaid hours. Esquith’s garlicky advice concerns matters both practical and spiritual, ranging from how to avoid bureaucratic pitfalls to keeping a close eye on yourself. Never confuse popularity or the ability to command obedience with effectiveness as a teacher, he cautions. He has some moments of sloppy thinking—surely he doesn’t truly believe “there’s nothing wrong” with teachers going by rote, their charges on autopilot—and his schedule is way too scant on physical activity, though one senses he'd fix that if needed. Mostly he is right there with the goods: sharp math problems, books he and his students enjoy, ways to instill social skills in preteens. “It’s dangerous to think too much about public education,” writes Esquith, but somebody has to, and it’s a lucky thing he decided to shove in his oar. 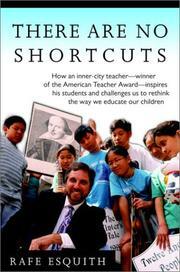 Like the author’s teaching style: freethinking, demanding, encouraging, at times bumptious.